New York, NY, January 1, 2009 - January is National Hot Tea Month and is also the height of the dreaded “cold and flu season”. The CDC estimates that there will be more than 200,000 Americans affected by the cold and flu this year, which leads to missing work, school and even social gatherings. So what can one do to avoid the cold and flu? The CDC strongly recommends an annual flu vaccine as the best way to reduce the chances that you will get the flu. In addition, drinking hot tea may also help you stay healthy during the cold and flu season. Published research from Brigham and Women’s Hospital and Harvard University indicates that theanine, an ingredient found naturally in tea, supports the immune system. A cup of tea contains an average of 20- 25 mg of theanine. Drinking tea throughout the day may strengthen the immune system which is something important to do during the cold and flu season. Tea also contains flavonoids, which are naturally occurring compounds known for their antioxidant properties. Antioxidants work to neutralize free radicals, which scientists believe damage elements in the body, such as genetic material and lipids, and contribute to many chronic diseases. The CDC states that healthy adults have a 30% chance of contracting the flu even with an annual flu vaccination, and the vaccine may be somewhat less effective for children and the elderly. And while drinking tea may not keep you from getting sick this season, it can help your odds of staying healthy. So why not do something good for your body while having a hot beverage…help stay healthy this cold and flu season and drink your tea every day! 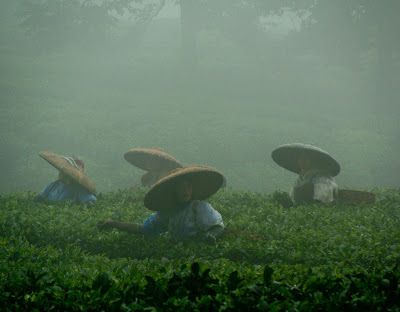 For more information about the role of tea in a healthy diet and lifestyle, please visit www.TeaUSA.org. 1.1 Kamath AB, Wang L, Das H, Li L, Reinhold VN, Bukowski JF. Antigens in tea-beverage prime human Vgamma 2Vdelta 2 T cells in vitro and in vivo for memory and nonmemory antibacterial cytokine responses. Proc Natl Acad Sci U S A. 2003 May 13;100(10):6009-14. Epub 2003 Apr 28. Oh my goodness! At first glance when I saw that picture, I thought it was 4 REALLY big mushrooms. . lol. Thank you for the information. It was very interesting. Question. . .any idea if the the health benefits stated would include brewed iced tea as well? I'm asking because I drink more brewed iced tea than hot tea. I think that brewed iced tea would have just as many benefits. Just be sure it doesn't contain high fructose corn syrup. That's funny about the mushrooms! Aren't those hats wonderful? It's like wearing an umbrella on your head. Such an informative post. I am not especially fond of herbal tea but I love a full bodied (but not bitter) cup of Black tea. I make a pot each morning just for me. My husband likes coffee better. I really like cream in my tea but have heard that it reduces its benefits. Really nice post. I love baby doll's tea, so cute! That photo is simply lovely! What an informative reminder to "drink more tea"! It was lovely to visit with you this evening - have a wonderful rest-of-the-week! Sounds as if I need to boost my tea consumption...one cup is probably not enough. Thanks for the info! I now know why my husband is so healthy. He drinks much more tea than I do... although I do love my cup of tea also. Great info. What a great picture. I also thought the hats were giant mushrooms for an instant. You have a beautiful blog, I think I will follow!